Depending on the nature of the job, turnover is often a great indicator of culture. If the turnover is high – then we would hope that the job role that we are looking at, or the nature of the work would be considered an entry-level job, or a stepping stone to another role. This would be considered natural and even good attrition ~ as people are progressing through the steps well. On the other hand, if the department does not consist of entry level or stepping stone types of roles, then this is a strong indicator that the culture of the environment is not a positive one. I have a great example of this – and I’m actually going to name names here because I think they deserve the accolade for doing things right! This is the Royal Automobile Club of Western Australia, in their Roadside Assistance Team. To get into this team, someone really has retire to open up a position. People love the work and the environment. I know this because of past experience with the individuals in the team. I recently had a breakdown – and a RACWA team member came to my rescue. We got into this discussion and the person shared with me how much the job meant and that the team is still the same in regard to culture. DO A CULTURE SURVEY. Do the survey with people inside and also outside of the environment. Ask what they think of the culture – what is positive about it and what is negative. Please do make sure that you include open frame questions and not just rating scales. You won’t get much useful information about HOW or WHAT to change with rating scales. ASK PEOPLE ABOUT THEIR LONG TERM ASPIRATIONS. Do they see themselves having a career here? Doing this role? Where do they want to be in 5 years? 10 years? When people are “head hunted” away to a higher position that we cannot offer. When a person has a life change (partner getting moved to another country) and they choose to follow that path. When a person has learned all they can learn here – and wants to seek something that we cannot offer. DO SOME RESEARCH and find out about the average tenure for people in this type of job role or occupation – and then work out what is needed to beat the average! Let you team know that this is happening – and ask for their input! Especially if you have people who have already been in the position for more than the average tenure. Ask them – DIRECTLY – what makes you stay here? A great sign that you have a positive culture is when people come to you (or to your department, or even to HR) in an unsolicited way. They specifically request to be interviewed and they leave their CV or Resume with the company, should another role become vacant. They say things like: I’ve heard such great things about working for this department – or even this particular person. I want to be a part of this team! Here are some things you can DO to become an Employer of Choice. Ask your current team members what would have to happen in order for them to invite their friends and relatives to join this team? What would make the culture and working experience so good that they would love to share this with the people who are really important in their lives? Go to other working environments and ask them about what makes a culture a good one – and what would make them want to leave? What would make them want to stay? NOTE: I think you will be surprised to find that money is rarely the main motivator! Run a Culture Workshop with your team. During this workshop, ask for the team’s input about what could be done to make this specific environment different in a positive way? What could we do to have FUN every day? What could we do that would have people excited about coming to work? What things could we do to make a difference for people here / now? Use an iWAM profile for all people and all roles. This particular recommendation is unique in that I am recommending a specific profiling device. This device is the iWAM. It stands for Inventory of Workplace Attitudes and Motivations. The device is exceptionally specific to details about working environments. It is very flexible and can be used in so many ways. Most interesting about this profile is that it can be used as a modeling device. You can model a person or a role – and then recruit to match what has been modeled! If you want more information about the iWAM profile and how it can be used, please contact me directly. I will also give you a download as part of this session so you can read more about the profile. Culture is Palpable – it can be felt, seen, touched. When I walk into an environment, I can often “FEEL” the vibe of the place. Culture is palpable! I specifically look for expressions on faces, body posture of people in the environment, signs on the walls, and general sense of energy in the place. Culture can absolutely be seen, heard and felt. There are so many signs – if one is only open to looking for them. The challenges is that we are often blinded by what we are a regular part of. It’s time to get the blinders off – and sometimes we need some outside input for this! SMILE A LOT! Speak with your team about smiling. Encourage smiling many times during the day. Give your team members some interesting information about the chemical processes that happen when a person smiles! Psychology today has a great blog that speaks about the neurotransmitters that are released by the brain every time we smile. Here’s another link to an article about mirror neurons. Mirror Neurons take input from outside sources and reflect that input internally. This is why we have reactions to things we see and hear. If you see a person accidentally stub their toe, you may flinch in response. This is your mirror neurons in action. This is cause of empathy for others. A Smile will very likely cause others to smile in return. The opposite is also true. If we are frowning or showing a look of worry or consternation – that will likely be reflected in others as well. CHOOSE YOUR ENERGY LEVEL! If you want for others to have “high energy” – then choose that energy level yourself. Walk a bit quicker. Speak a bit more quickly than usual (unless you are already a very fast speaker – then don’t). Show your excitement and invigoration for things. Get a bit more animated that you might normally do. Again, the mirror neurons will respond in others. PRAISE PUBLICLY! Give lots of regular praise. Do so in a place where others hear this happening. Give THANKS for things people do regularly. If a person cleans something up – verbalise your thanks – even if this is a part of his/her job! Verbalise the positive things regularly and encourage others to do so as well. This can alo be translated into verbally remembering special occasions. Announce people’s birthdays (if people are happy for this to happen). Announce people’s work anniversaries, announce special accomplishments – EXAMPLE: If a person has just completed a learning module and is on the path for a higher level of learning or growth! 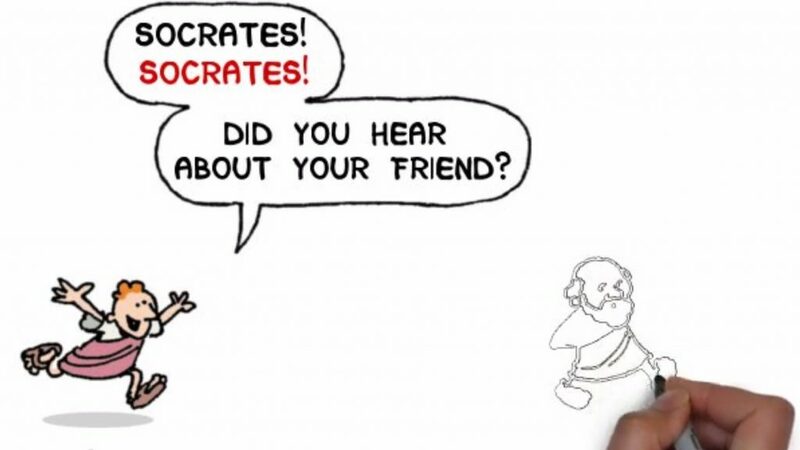 Time to Obliterate Gossip – Through Widescale Implementation of the Socratic Rule of 3. A lot of environments have a negative and tarnished culture because of rampant gossip and rumour mongering. My suggestion is to be a staunch ambassador for the Socratic Rule of 3 Test before saying things: Here is a story to share with you to illustrate this.